Dr. Sharon Gopaul-McNicol addressing the public session of the People's Labour Party's third annual National Convention. Shared, common interests and recognition of Prime Minister Hon. Dr. Timothy Harris as a leader were the keys to Team Unity’s success, a research said at the the People’s Labour Party public session on Saturday. “The coming together of Team Unity was not just to get rid of [the incumbent party]. 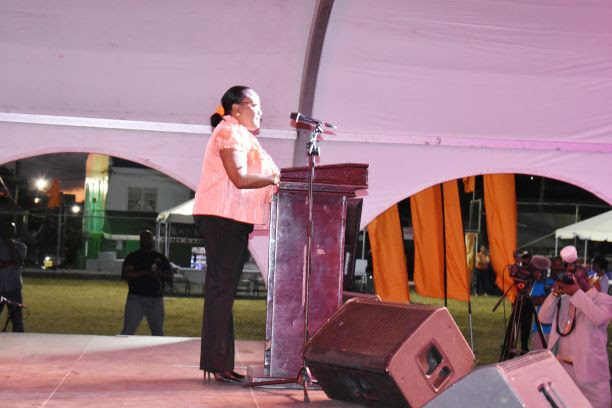 It was making sure that their common interests would be crystallised in policies endemic to the national development of St. Kitts and Nevis,” said Dr. Gopaul-McNicol. Dr. Gophaul-McNicol is a social scientist and former MP from Trinidad and Tobago. “The greatest surprise is that this did not happen…and I tip my hat off respectfully to the PAM party and all of the players, every last one of them, they knew that Dr. Harris had clearly met all the leadership requirements to take Team Unity and St. Kitts and Nevis forward,” said Dr. Gopaul-McNicol. Dr. Gopaul-McNicol compared the Team Unity coalition favourably to political coalitions in Trinidad and Tobago which historically had to come together in a short amount of time and were not able to create firm relationships. “The other good thing about the formation of [Team Unity] is that it is the only coalition that was formed in the region 20 months before the election,” she said.